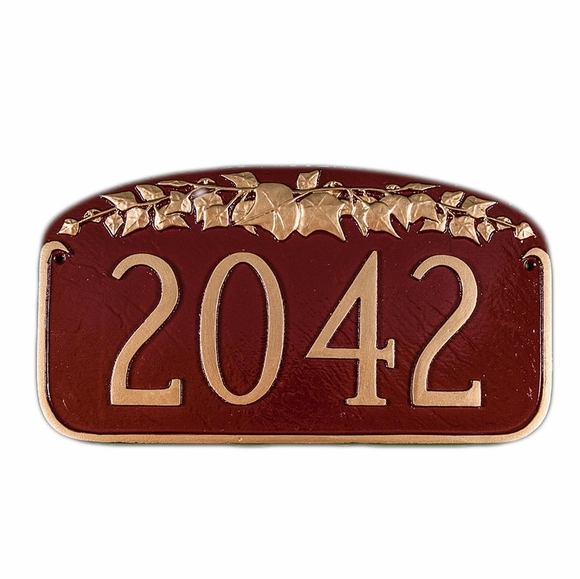 Personalized Ivy Leaf Address Plaque - - one line address sign accented with an ivy leaf garland. Nature theme sign. Made in USA. Address shown on sample sign above: 2042. Solid cast aluminum construction. Characters and border are part of the sign, not added on. Made in the USA. I LOVE this plaque! It was between the Ivy and the Pine Cone design, and I couldn't have gone wrong either way. Ordered the antique bronze & gold to match my mailbox. Matches very well so I didn't mind the $10 up-charge. I also just did my house number in the 4" size to be better seen from the street. As for turn around time, patience is key since personalized plaques can take up to 6wks, but got mine in around 4wks. All in all, I would recommend this plaque to friend or family member looking for something different, elegant, and a great price...especially for containing characters above 3". Very pleased with my purchase.